This is a very elegant ring signed with the initials 'G V F' for the well-known Florentine maker Girolamo della Volpaia. 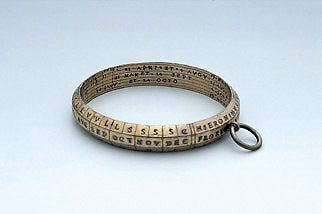 The external part of the ring is marked with the names of the months and the corresponding initials of the signs of the zodiac, and the letters 'G', 'H', 'F'...'D', 'E'. These letters are used to find which zodiac sign the sun is in at any time of the year. On the inside of the ring is a calendar scale.